Color Vision Testing – Identifies any color deficiencies such as red, yellow, blue or green. At a ratio of 8 to1, men are more affected by red-green color vision deficiencies than women. Although less common, blue yellow deficiencies affect men and women equally. Cover Test and Ocular Mobility Testing – Allows the doctor to identify if your eyes are working together (binocularly) and to identify if there is decreased eye movement such as amblyopia, exotropia and strabismus. These diagnoses can affect a patient’s ability to read and may cause issues with eye hand coordination. Fundus Exam – As one of the most important parts of any eye exam, the doctor will examine the health of the inside and back of your eyes through dilation or retinal photography. With dilation the doctor will put drops in your eyes that force the iris not to respond to bright lights. Doing this allows the doctor to evaluate the structures inside your eye such as blood vessels, the macula and the optic nerve. The most common side effects of the eye drops are four to six hours of blurred vision and light sensitivity. Retinal photography allows our doctors to perform a fundus exam without the side effects of dilation by use of a specialized imaging device. This device is capable of giving the doctor a nearly 200 degree view of the structures inside your eye. Pachymerty – This painless procedure gives doctors a measurement that determines corneal thickness. The measurement is vital in calculating the true intraocular pressure for some patients who may be susceptible to glaucoma. Additionally corneal swelling could be a sign of conditions such as Fuch’s Dystrophy. Refraction – The doctor uses the phoropter to place a series of lenses in front your eyes and asks “Is this better? one or two?” Your responses to the doctor help ensure you receive the correct eyeglass prescription. Typical diagnoses of refractive errors are nearsightedness, farsightedness and / or presbyopia. Slit Lamp – The slit lamp is a binocular microscope used by the doctors to evaluate the structures of your eyes, such as the cornea, iris, lens, lids and surrounding tissue. With the use of additional hand held magnifying lenses, the doctor may be able to examine structures further back in the eye such as the retina, macula and optic nerve. Tonometry – “the puff test”. Using a non-contact tonometer (NCT) or applanation tonometer, the doctor is able to determine your intra-ocular pressure (IOP). Elevated pressure readings could be an early indication of glaucoma. However, additional testing is needed to diagnose glaucoma. 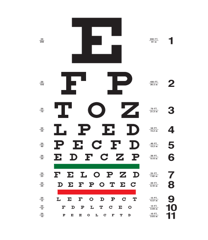 Visual Acuity – Measures the sharpness of your vision. Sets a base line for the doctor to know your aided and unaided vision before any additional tests are performed. An example could be that you are 20/20 with your glasses on, but 20/400 when you take them off. Visual Field Testing – Testing a patent’s visual field measures both straight ahead and peripheral vision. A painless test, the procedure uses a series of light stimuli (flashes) in different quadrants of the patient’s eye as he/she stares at a fixed point. A recording of the patient’s responses to the light stimuli allows doctors to determine vision loss due to glaucoma, tumors, neurological disorders, stroke, MS and other health conditions.